Students who wish to keep their cars on campus must register them annually with the Director of Students. A photocopy of the proof of insurance must also be submitted at the time of registration. Cars are to be parked only in the lots and spaces provided and marked for that purpose. Cars are not to be parked around the inner perimeter of the seminary buildings, except in the spaces clearly marked for parking and by those assigned to those spaces. In particular, this applies to the area fronting the library on each side of the roadway. Students are not to park in the spaces reserved for the faculty and employees of the Seminary. The fire department requires that the access roads in each direction be kept clear at all times. Students may use the access roads close to the dormitory building for conveniently loading and unloading their cars as long as the cars are not left parked and unattended longer than is necessary to complete the immediate task. The Seminary administration retains the right to issue parking violation notices. Parking areas and traffic lanes are checked several times each day and evening on a scheduled, though irregular, basis. In each semester (summer IPSF program considered as an independent summer semester), the first two parking violations a student receives will carry a fine of $5.00, which will be deducted by way of garnishment from wages earned for employment on campus or from the monthly stipend of the L.A. Plan for Los Angeles Seminarians. Students not included in either of these two categories will be billed for the violation. Bills remaining unpaid by the last day of the semester will be forwarded to the student’s vocation director or superior for payment. After two violations, the third and fourth parking violations will carry a fine of $10.00. A fifth violation in a given semester, as defined above, will result in the loss of the privilege of parking on campus, with the Seminary maintaining the right to have the car towed from the campus at the student’s expense. 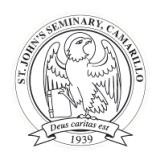 St. John’s Seminary provides a few vehicles for the use of students who (a) are involved in Field Education or (b) are doing official seminary business or (c) have a serious personal need and do not have a car at their disposal. Seminary Field Education cars are to be reserved through the Student Car Coordinator between the hours of 8:30 A.M. and 4:00 P.M., Monday through Friday ONLY. Reservations must be made 24 hours in advance. Keys are to be picked up during these hours and returned immediately upon return to the seminary. No arrangements are to be made outside of the designated times. Students who own their own cars, or who have access to vehicles other than those of the seminary are not entitled to borrow seminary cars for personal business. Students who use a seminary car for personal business (for any purpose other than official seminary business) are required to pay a per mileage fee. Only when students are using a car for official seminary business does the seminary take responsibility for this charge. Ordinarily, seminary cars are not to be used overnight for personal need. Any personal use of seminary cars over 100 miles or use over 5 hours requires the permission of the Student Car Coordinator and the Director of Students. Determination of “official seminary business” and of “serious personal need” is made by the Student Car Coordinator, who may consult the Director of Students before granting use of the seminary car. Students are not to use seminary vehicles without permission, nor to pass keys to another student unless directed to do so by written instruction from the Student Car Coordinator.